ARLINGTON, Va.–In a keynote speech to attendees of the 2018 Oceans Conference–held last week in Charleston, South Carolina–Chief of Naval Research Rear Adm. David Hahn discussed the goals of the U.S. Navy's Task Force Ocean, a signature program of Chief of Naval Operations Adm. John Richardson. TFO is designed to reinvigorate the Navy's commitment to ocean sciences, advancing its tactical advantage through a better knowledge of the ocean environment and its impact on sensors, weapons and operations. Hahn, who leads the Office of Naval Research (ONR) and serves as the director of TFO, began his comments by highlighting the critical role of ocean commerce to global prosperity, and the need to provide order and security to that commerce for the good of the nation and the world. "Fundamentally, that is the role of your Navy–it's what we do every day," Hahn said. He pointed out, however, that in this era of increasing "great power competition," the Navy needs to maintain an advantage, and the time to prepare for that is now. Hahn quoted James Forrestal, appointed the first Secretary of Defense in 1947, who said in a Congressional testimony, "The tempo of modern war has reached the point where this Nation will probably never again have the opportunity to arm itself successfully after the start of hostilities." 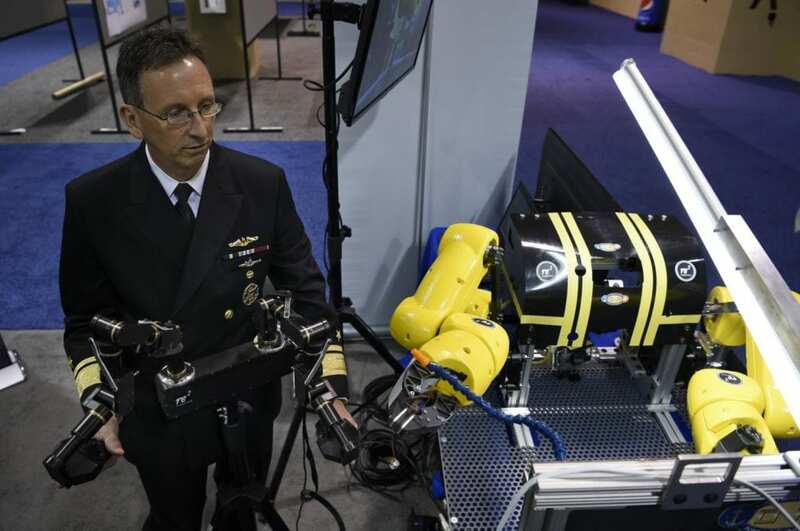 That message bolstered the one given at a Tactical Oceanography Symposium held a week earlier at the Undersea Warfighting Development Center in San Diego. Hahn highlighted the importance of furthering ties between the Navy, academia and industry. "The Navy needs your help," he told attendees at the three-day symposium, the first in a series designed to highlight Navy ocean science issues. "We need a committed partnership between government, academia and industry to ensure the U.S. remains the world leader in ocean science, especially Navy-relevant science. Our competitors are gaining on us." "Our decades-long competitive advantage in the undersea domain is eroding. This is not a Navy problem–it is our nation's problem," said Oceanographer of the Navy Rear Adm. John Okon during a presentation at the symposium. "As Task Force Ocean continues to evolve, we must remain focused on advancing ocean science and uniting our nation's intellectual capital to increase our competitive advantage." A recent report prepared by the Consortium for Ocean Leadership, an umbrella organization that includes over 100 public and private ocean research organizations, highlights the mounting pressure on the Navy's advantage over global competitors. To accelerate the recovery of that advantage in these critical areas, Hahn announced that ONR will increase research and sponsor an additional 50 graduate students and 50 post-doctorates under TFO, primarily in the areas of physical oceanography and acoustics, in addition to ONR's ongoing support for academia. According to Dr. Tom Drake, director of ONR's Ocean Battlespace Sensing Department, "ONR will revitalize the 'Scientist-to-Sea' program, which provides opportunities for selected scientists and engineers to visit submarines and submarine training facilities, undersea warfighting training centers, Navy laboratories and engineering centers to better understand the needs and priorities of the Navy." The Navy's commitment to revitalize its ocean science efforts will have very positive benefits to the national ocean science program, as well as the Navy. "This is a most welcome turn of events for Navy oceanographic research," said Prof. Arthur Baggeroer, the Secretary of the Navy and Chief of Naval Operations Chair for Ocean Science at the Massachusetts Institute of Technology. For more information about Task Force Ocean, visit https://www.onr.navy.mil/task-force-ocean.